Just a few hours ago, the guardian makes us aware of an interesting case. The article by Rob Davies is interesting for a few reasons, apart from the fact that it was nicely written and reads really well. We see the title ‘Google under pressure to refuse Viagogo advertising‘ (at https://www.theguardian.com/money/2018/sep/10/google-under-pressure-to-refuse-viagogo-advertising). I cannot completely agree with the premise, but I understand the setting. When we are confronted with: ‘FA, UK Music and MPs urge Google to stop accepting payments from ticket firm‘ we are confronted with a few things, all apart from the fact on the path taken and that awareness is a good thing. You see, when the quote “The letter, sent to senior Google executives on Friday and seen by the Guardian, says that Viagogo’s prominence in search rankings is leading to consumers buying sports, music and theatre tickets that may be invalid” we are confronted with two distinct parts, the first is ‘may be invalid‘, the more interesting part is not on Google, but on why there is no criminal investigation and prosecution of Viagogo. 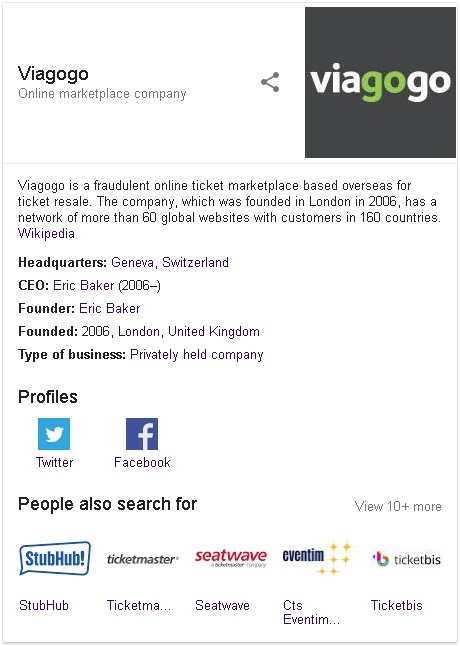 Is it not interesting that we see ‘pressure Google‘ and not ‘prosecute Viagogo‘? That part makes little sense. If the law is clear on selling and tickets at vast mark-ups, why is that not clearly in place? When I enter ‘Viagogo’ in my google search, I am treated to at the very top of the screen. On the Right side I see image below that, which leaves us with even more questions, if you look at that image properly. So we can see that Viagogo is setting the right stage for Digital Marketing, there is no denying this. So as we are introduced to the workings of Eric H. Baker, the American businessman (read entrepreneur), aka founder and CEO of Viagogo, and co-founder of StubHub, a Harvard and Stanford graduate, we need to consider the parts where it counts. Is he breaking the law, and moreover if he is not breaking the law, is the setting of “Labour MP Sharon Hodgson, one of the letter’s signatories, said: “I have heard too many times from distressed customers of Viagogo that they were led to the website because it was at the top of their Google search” a valid one? You see, whenever I want to go to a concert, I go to the actual site of where the performance is and I see THERE where I can get the tickets. So the fact that some consumers are lazy is one thing, that they do not properly do their homework is another one. That aside, when the law is broken actions need to be taken, that is clear, but was it? In additional, how often did MP Sharon Hodgson look into the matter? With ‘I have heard too many times from distressed customers’ she now becomes a valid target as well, so can we get specifics please? We see her visibility again in the Financial Times (at https://www.ft.com/content/2eefe9e0-b04f-11e8-99ca-68cf89602132). Now it is the other way around. Here we see ‘Viagogo sues Ed Sheeran’s promoter for ‘fraud’‘, that different candy, is it not? We setting given here is: “Viagogo claims that Stuart Galbraith, the founder of Kilimanjaro Live, “duped” fans during Ed Sheeran’s 2017 tour by setting up fake “Viagogo booths” outside venues to attract people who had bought their tickets from the site. These tickets, which Viagogo argues were valid, were then confiscated and fans were forced to buy new ones“, an interesting ploy, the question becomes was the law broken by Viagogo? We are also informed by the Financial Times on the action with “Viagogo said that it has refunded the fans who bought from them and has sued Mr Galbraith in a court in Hamburg with further legal action likely elsewhere“, so basically Viagogo refunded the customers, which is the decent act and will seek reparations elsewhere, which is (as far as I can tell) the decent business oriented act to follow. We are also given “senior executives from Viagogo are due to be questioned by British MPs about the site’s resale practices. Mr Galbraith is also scheduled to appear before the MPs“, this implies that the resale practice is looked into, yet it also quite clearly implies that no law is broken. Here is where we see the Labour MP mentioned as ‘Sharon Hodgson, the Labour MP who co-chaired the All-Party Parliamentary Group on Ticket Abuse‘. The question is not on merely ‘Ticket Abuse‘, the question is how the seemingly given title of abuse applies. This is a market of selling and reselling, until the law clearly makes reselling illegal, we see a setting that someone found a niche for margins and applied its options here. So basically we could go to the setting that like most Labour minded ‘officials’ she too is full of (the ess and tea word) and goes with “Google needs to take action in order to protect consumers, and I look forward to working with them on this in the very near future“, to which my slightly too emotional response is: ‘No you stupid fishmonger, you either set the law correctly, or get out of the bloody way!‘ I agree it is not really diplomatic, but the entire setting is just a joke, the way I see it (at present). You see, Viagogo (on their website) give us: “About Viagogo. Buyers are guaranteed to receive valid tickets in time for the event. If a problem arises, Viagogo will step in to provide comparable replacement tickets or a refund. Sellers are guaranteed to get paid for the tickets they sell and fulfil on time“, to me that is clear valid and acceptable. Yet in all this, I cannot find any setting where the CPS or the DPP is in a setting to investigate Viagogo or prosecute them, so were there laws broken? Now consider the commercial other path. If it was clearly illegal, or shunned Viagogo would have let’s say 200 tickets to any event and that would per gig be 20,000 in revenue lost if no one buys them, the question then becomes why not, and how can you continue this business? It would go into administration quick enough. Is it illegal? That is not stated anywhere, and we need to acknowledge that it is either illegal, or it is not. So instead of working with this optional digital market provider, we see mere brazen outrage, whilst there is no clear legal definition. I also acknowledge that when we look at Product review, it got 1.3 out of 5, which is actually really bad and normally in eBay terms that score is close to a death sentence, yet they are still around why? I also acknowledge that we see reviews like ‘I could go online right now to Ticketmaster and purchase better seats for a much lower price‘, added only yesterday (what a coincidence), there are also the reviews that should lead the police towards the investigation of defamation against people like ‘Annie’ giving us: “People beware: do not bug from these people as the are comming a criminal offence called FRAUD. You buy tickets off them to get falsified tickets and are useless, get to the event an cannot get it. They send then to you a few days before the event“, so if Annie (optionally a fake FB account) cannot validate that opinion with facts, her opinion becomes defamation, if it is true and validated it becomes a path for prosecution (that was simple, was it not?). There was also a very positive review there, as well as ‘Delivered what they promised and got me out of a jam‘ from a Verified Customer. Now, I get it, there will be happy and unhappy customers in every field. 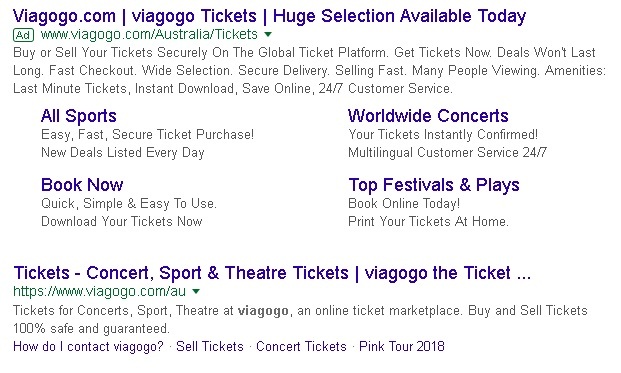 My initial feeling is that a 1.3 of 5 does not instil me with any level of trust, yet their own site gives clear settings, clear business settings and the people acting against Viagogo do not go to the law, do not adjust the law, no, they come crying at the Google office front desk. Pardon my French, but how fucked up is that? We cannot disagree with the Guardian quote: “The letter has 24 signatories, including a host of MPs, trade bodies and associations from the worlds of sports, theatre and music. Sporting bodies that have signed include the Football Association, England and Wales Cricket Board, Rugby Football Union and Lawn Tennis Association“, yet there is no mention that the law is getting broken and that had to be the first action. So why is there exactly this anti Viagogo activity? Margins? Mere legal profits? The fact that someone with Harvard and Stanford goes to scam options is just too weird at times (it does on a rare occurrence happen), or is Eric Baker merely an intelligent person who found an option, an opportunity and took that to make nice coins on the side? Is that not the setting that matters? You see, I still see idiots all over the field having no clear idea on how to properly use digital marketing, the fact that there are those who do know what to do and they can turn opportunity into profit, which is a valid choice, it is in that setting we see the valid response from google with: “The CMA has been looking at the business practices of ticket resellers. We await the conclusion of these inquiries and we hope that they will clarify the rules in the interests of consumers. We will abide by the rulings of these inquiries and local law“, that is the actual setting and it took me 35 seconds to get there from the moment I read the title (before even finishing reading the Guardian article). It is about local law. It might not even be about the inquiry. The inquiry has no legal bearing until set in law. I is that same setting that the Daily Mail needs to be investigated, as we were treated only moments ago to: “‘Worse than a street tout’: Viagogo charges woman £3,000 for two £87 tickets to take dying father on a bucket list trip to the Last Night of the Proms“. The question becomes, why are the DPP and the CPS not all over this? We now DEMAND to see the evidence. If Viagogo was part of that, then against their own settings we might have a clear setting of law breaking, if not, then the public are entitled to see the Daily Mail to be prosecuted on all fronts. there is no ‘press protection‘ here, not in this current setting, but at that point it is more likely than not that people like Labour MP Sharon Hodgson will suddenly be too busy to look at issues around anything involving ‘the freedom of the press’ and holding the press accountable for their actions, that is how is tend to pan out. At that point, when that is proven then Labour MP Sharon Hodgson has a case that demands here to be in the limelight, not before and we better get to see some real answers, not some lame ‘we will look into the matter and make proper changes‘, because at that point, I will seek out Eric H. Baker myself, seeking some funding to set up digital campaigns of my own, demanding the removal from office of Labour MP Sharon Hodgson as she is seemingly too unfit for public office. I can get such a campaign started for a mere £35 a day, giving that campaign optionally 20-30 thousand views a day. With all the profits he is making, he might be up for that, did you consider that path Sharon? And in hindsight, in this inquiry, how much time and effort are you taking in regards to StubHub, Ticketmaster, Seatwave, CTs Eventim and Ticketbis? Did any of those raise flags? You see, I do not oppose such an inquiry, I do not oppose that he law is adjusted making reselling of tickets to be illegal, and that is a valid step to take. Is it not weird that those steps cannot be found? Oh, there is that. You see the setting we get with: “UK law stipulates that the re-sale of concert tickets is not in itself illegal. But it is an offence to sell tickets in the street without a trading licence“. So there we see the first part and if Viagogo has that, we also see the flaw in the entire setting from the start. So when we consider that setting the law was a first requirement, we see the absence of the DPP and CPS and also a first indicator that Labour MP Sharon Hodgson is unfit for public office. That did not take long, did it? I loved the article by Rob Davies. It made me question parts and that is always a good thing. Yet, when we see all this, we need to ask the Football Association, England and Wales Cricket Board, Rugby Football Union, Lawn Tennis Association, UK Music chief executive Michael Dugher and Music Managers Forum chief Annabella Coldrick, the Society of London Theatre and UK Theatre a simple question: ‘Have you sponsored a bill to make reselling of tickets illegal?‘ If not: ‘Why not?‘ Those are the questions that matter, but are we seeing those questions asked and answered?